War Horse was written by Michael Morpurgo in 1982 and is his most successful book to date. The novel was then adapted for the stage by Nick Stafford. The current show is a Touring Theatre Production in association with the award-winning Handspring Puppet Company. 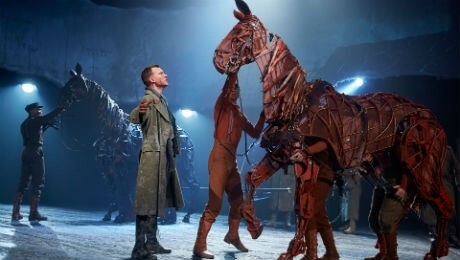 Since its premiere in 2007 War Horse has toured world-wide and has had runs both in the West End and on Broadway in addition to being brought to the big screen by Steven Spielberg. The Play is set following the outbreak of World War One. Joey, young Albert’s beloved horse is sold to the cavalry and shipped to France. He is soon caught up in enemy fire, and fate takes him on a journey, serving on both sides before finding himself alone in no man’s land. Albert, who remained on his parents’ farm in Devon, cannot forget his beloved Joey. Though still not old enough to enlist he embarks on a treacherous mission to find him and bring him home. Although there are no musical numbers on this production the Song person holds the play together beautifully with his accordion-accompanied laments. The main Three characters in the Production are Albert Naracott: (Scott Miller); Albert’s mother Rose (Jo Castleton); and Albert’s dad Ted (Colin Connor). However, the real show stealers are the horses Joey and Topthorn played by up to twelve puppeteers in rotation. The puppetry within the show is a joy to behold. It’s emotional, moving, captivating and as an audience member you are thrust into the middle of the First World War through the performances given by the entire cast. The special effects used are as good as anything you would see on a big budget movie production. This production will change the perception of the most ardent of pacifists. Directors Marianne Elliott and Tom Morris have masterfully pulled this one out of the bag and the Puppet Company beautifully re-create the majestic movement of the Horse. It is wonderfully captivating and sad but truly heart-warming too. Some of the language used and the loud explosions that form part of the play are likely to make this production unsuitable for the under-10s but this should not deter your attendance, This is a powerfully moving and imaginative drama, filled with stirring music and containing phenomenal story-telling and visual effects. The life-sized horses are brought to breathing, galloping, charging life before your very eyes. Don’t just trot down to the Regent to watch this masterpiece. You should gallop!!! It will both captivate and move you to tears. The production runs to April 6th with evening performances beginning at 7.30. The show has a running time of 2 hours 45 minutes including interval.